Arthrodesis remains effective for most patients with end-stage hallux rigidus, but finding an alternative that allows more range of motion can be challenging. Faced with disappointing arthroplasty outcomes, surgeons have had to get creative. Given the advances in artificial replacement joints for the knee and hip, nobody sane would opt for joint fusion in those cases if they had a choice. But foot surgeons are faced with a more complicated decision process when dealing with hallux rigidus and the first metatarsophalangeal (MTP) joint of the foot. Recent studies suggest that implants in that part of the body present a number of problems, but though joint fusion (arthrodesis) still works well for pain relief and general function, some patients want more range of motion (ROM) than arthrodesis offers. For those individuals, surgeons are developing techniques that rebuild the joint without fusing or replacing it. So how does a surgeon—or a patient—choose? Comparisons can be difficult because outcomes depend to some degree on who performs the operation, and on what the patient wants. Kim was lead author of a 2012 retrospective review in the Journal of Foot and Ankle Surgery (JFAS) that compared outcomes for three procedures: arthrodesis, hemi-metallic joint implant, and resectional arthroplasty. After three years, the surgeries all appeared to be viable options for treating end-stage hallux rigidus.2 But all had issues: metatarsalgia occurred in 9.8% of arthrodesis patients, bony overgrowth into the joint occurred in 28.3% of the hemi-implant group, and 30.9% of patients experienced floating hallux after resectional arthroplasty. Moreover, particularly when it comes to implant procedures, some clinicians feel three years isn’t long enough to judge outcomes. As Kim noted, surgeon training and preference are key determinants of which procedures get done. In more serious cases, however, Kim chooses arthrodesis. When he has such concerns, Kim sometimes opts for a modified Keller arthroplasty—excision of the proximal part of the phalanx. Lowell Weil Jr, DPM, told LER that some problems have resulted from poor patient selection. Weil, president of the Weil Foot & Ankle Institute in Chicago, and team podiatrist of the White Sox, is nevertheless coauthor of one of the positive articles cited above and defends the use of silastic implants in the right patients. Weil added that the breakdown problems of earlier decades have been at least partially addressed by the addition of titanium grommets to the devices. “The grommets create an interface between the bone and the silastic, so the bone edge won’t roughen and break down the implant prematurely,” he said. Weil also noted that, contrary to conventional wisdom, revision surgery needn’t necessarily entail arthrodesis, which is difficult in such patients because so much bone has been removed to place the implant. Lawrence Oloff, DPM, who practices at Sports Orthopedic & Rehabilitation Medical Associates in Redwood City, CA, and is a team podiatrist for the San Francisco Giants, takes issue with much of this. Oloff graduated from podiatry school in 1976 and calls himself a “dinosaur”—though he thinks he’s learned from his mistakes and adapted. So far he’s avoided extinction. Oloff suspects that part of the reason implants fail is that they can’t yet account for the complex movements of the MTP joint. Oloff is critical of companies that bring new products to market without what he considers adequate testing. Eric Bluman, MD, PhD, an assistant professor of orthopedics at Harvard Medical School in Boston, suggested another reason artificial joints might not work as well in the foot as in other parts of the body. The MTP joint, by contrast, is more of a hinge joint, in which weight doesn’t help compress an artificial device so that it stays in place. Soft issue coverage of the hip and knee is also greater than at the toe joint, Bluman said, which may facilitate functional ROM. Jeffrey Johnson, MD, associate professor of orthopedic surgery and chief of the Foot and Ankle Service at Barnes-Jewish Hospital at Washington University Medical Center in St. Louis, voiced other concerns. Johnson added that published results may be misleading. David Thordarson, MD, a professor of orthopedic surgery at Cedars-Sinai Medical Center in Los Angeles, acknowledged that, intuitively, an MTP joint implant should make sense. Thordarson echoed Johnson’s concern about follow-up in published research. From Larry Oloff’s perspective, it generally makes sense to minimize surgical impact now so that clinicians can avail themselves of better solutions when they become available later. In such cases, Oloff starts with a cheilectomy to remove bone spurs, then shortens the metatarsal slightly to put slack in the joint for better range of motion. “I’m high on osteotomy because we’re mainly a sports medicine group, so our patients are younger and active, and they want to get their activity back on track,” he said. 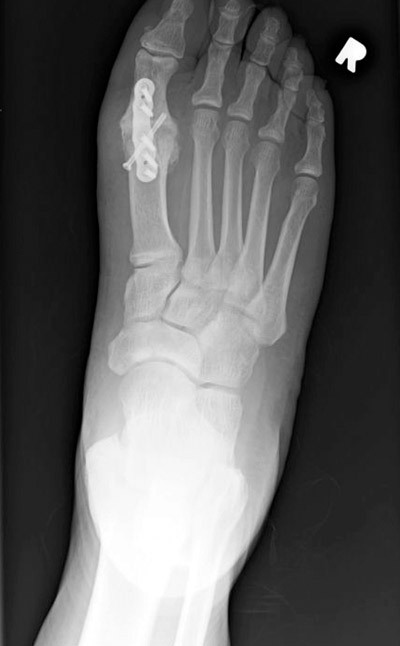 “Osteotomy has been developed on the spurious idea that it is necessary to treat a long and/or elevated first metatarsal relative to the second,” the author of that review, Thomas Roukis, DPM, PhD, told LER via email. Roukis practices in the Department of Orthopaedics, Podiatry and Sports Medicine at the Gundersen Lutheran Medical Center in La Crosse, WI; he is also president-elect of the American College of Foot and Ankle Surgeons. Eric Bluman usually opts for an arthrodesis, cheilectomy, or—he’s with Oloff on this—metatarsal osteotomy. There are such cases, however. For example, Bluman has had patients for whom yoga, Pilates, and similar practices requiring full joint ROM are very important. 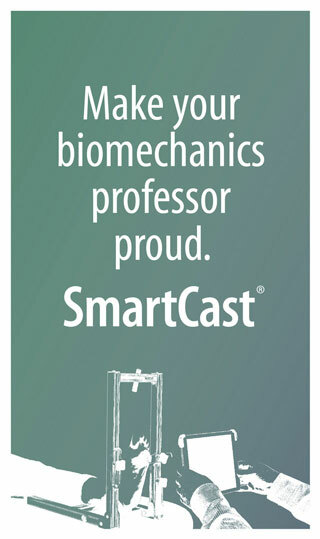 Even so, Bluman admits to being leery even of hemiarthroplasties. Oloff noted further that fusion closes the door on later joint replacement, should technology improve. 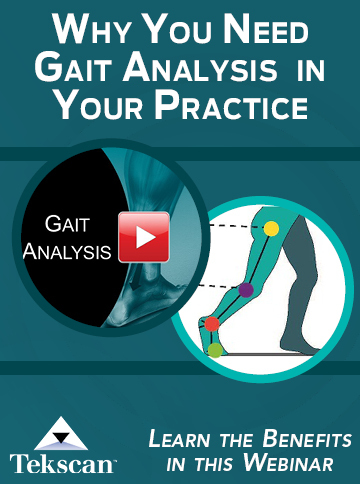 Johnson noted that in an optimal approach, the big toe is positioned so it doesn’t impede normal heel-to-toe gait; it has a little dorsiflexion, neutral rotation, and a little valgus. Thordarson’s preference is interpositional arthroplasty. His approach is to detach the ligaments from around the end of the first metatarsal, then cut a little bone out of the joint and put the ligamentous tissue into it, to provide a cushion. Jeffrey Johnson also favors interpositional arthroplasty. Despite professional disagreements about the relative value of different surgical procedures for hallux rigidus, it seems likely that arthrodesis will continue to play a significant role in the near future. It’s also probable that many clinicians will continue to do their best to preserve joints, due to both the promise inherent in interpositional arthroplasty and the hope that implant technology may someday surmount the limitations that still afflict it. 1. Oloff L, Traynor C, Vartivarian S. Joint salvage techniques for stage III/IV hallus rigidus. In: Waddell J, ed. The Role of Osteotomy in the Correction of Congenital and Acquired Disorders of the Skeleton. InTech; 2012. 2. Kim PJ, Hatch D, Didomenico LA, et al. 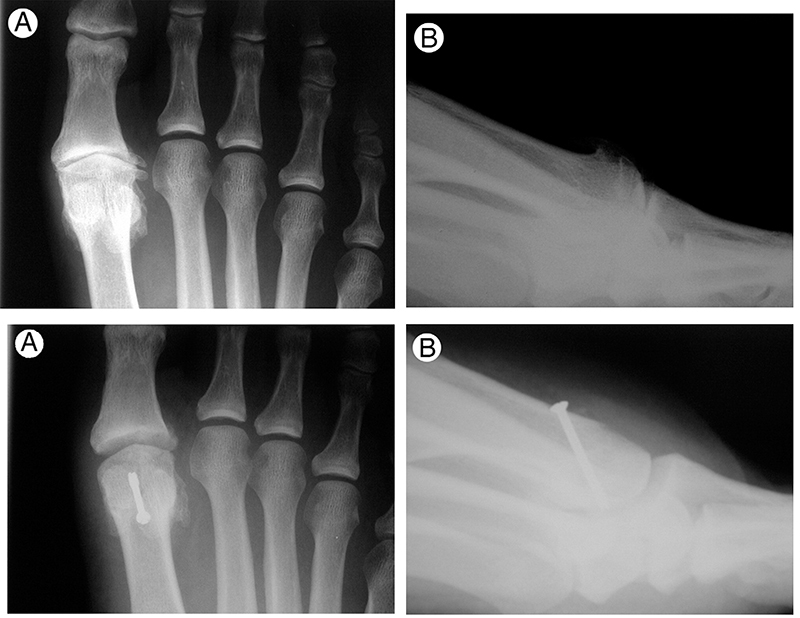 A multicenter retrospective review of outcomes for arthrodesis, hemi-metallic joint implant, and resectional arthroplasty in the surgical treatment of end-stage hallux rigidus. J Foot Ankle Surg 2012;51(1):50-56. 3. Roukis TS. The need for surgical revision after isolated cheilectomy for hallux rigidus: a systematic review. J Foot Ankle Surg 2010;49(5):465-470. 4. Roukis TS. Outcomes after cheilectomy with phalangeal dorsiflexory osteotomy for hallux rigidus: a systematic review. J Foot Ankle Surg 2010;49(5):479-487. 5. Morgan S, Ng A, Clough T. The long-term outcomes of silastic implant arthroplasty of the first metatarsal phalangeal joint: a retrospective analysis of one hundred and eight feet. Int Orthop 2012;36(9):1865-1869. 6. Ter Keurs EW, Wassink S, Burger BJ, Hubach PC. First metatarsophalangeal joint replacement: long-term results of a double stemmed flexible silicone prosthesis. Foot Ankle Surg 2011;17(4):224-227. 7. Sung W, Weil L Jr, Weil LS Sr, Stark T. Total first metatarsophalangeal joint implant arthroplasty: a 30 year retrospective. Clin Podiatr Med Surg 2011;28(4):755-761. 8. Brewster M. Does total joint replacement or arthrodesis of the first metatarsophalangeal joint yield better functional results? A systematic review of the literature. J Foot Ankle Surg 2010;49(6):546-552. 9. Dawson-Bowling S, Adimonye A, Cohen A, et al. MOJE ceramic metatarsophalangeal arthroplasty: disappointing clinical results at two to eight years. Foot Ankle Int 2012;33(7):560-564. 10. Oloff LM, Jhala-Patel G. A retrospective analysis of joint salvage procedures for grades III and IV hallux rigidus. J Foot Ankle Surg 2008;47(3):230-236. 11. Roukis TS. Clinical outcomes after isolated periarticular osteotomies of the first metatarsal for hallux rigidus: a systematic review. J Foot Ankle Surg 2010;49(6):553-560. 12. Leaseburg JT, DeOrio JK, Shapiro SA. 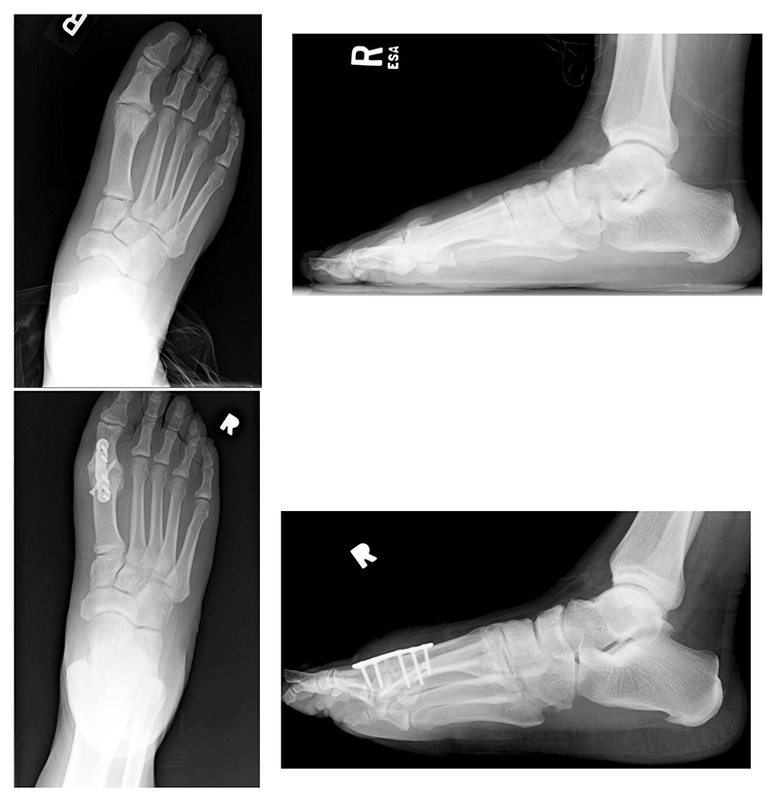 Radiographic correlation of hallux MP fusion position and plate angle. Foot Ankle Int 2009;30(9):873-876. 13. Roukis TS, Meusnier T, Augoyard M. Nonunion rate of first metatarsal-phalangeal joint arthrodesis for end-stage hallux rigidus with crossed titanium flexible intramedullary nails and dorsal static staple with immediate weight-bearing. J Foot Ankle Surg 2012;51(3):308-311. 14. Roukis TS, Jacobs PM, Dawson DM, et al. A prospective comparison of clinical, radiographic, and intraoperative features of hallux rigidus. J Foot Ankle Surg 2002;41(2):76-77. 15. Roukis TS, Jacobs PM, Dawson DM, et al. A prospective comparison of clinical, radiographic, and intraoperative features of hallux rigidus: short-term follow-up and analysis. J Foot Ankle Surg 2002;41(3):158-165. 16. Hahn MP, Gerhardt N, Thordarson DB. Medial capsular interpositional arthroplasty for severe hallux rigidus. Foot Ankle Int 2009;30(6):494-499. 17. Mackey RB, Thomson AB, Kwon O, et al. The modified oblique Keller capsular interpositional arthroplasty for hallux rigidus. J Bone Joint Surg Am 2010;92(10):1938-1946. 18. Berlet GC, Hyer CF, Lee TH, et al. Interpositional arthroplasty of the first MTP joint using a regenerative tissue matrix for the treatment of advanced hallux rigidus. Foot Ankle Int 2008;29(1):10-21. 19. Hyer CF, Granata JD, Berlet GC, Lee TH. Interpositional arthroplasty of the first metatarsophalangeal joint using a regenerative tissue matrix for the treatment of advanced hallux rigidus: 5-year case-series follow-up. Foot Ankle Spec 2012;5(4):249-252. 20. Roukis TS. Outcomes following autogenous soft tissue interpositional arthroplasty for end-stage hallux rigidus: a systematic review. J Foot Ankle Surg 2010;49(5):475-478. 21. Roukis TS, Landsman AS, Ringstrom JB, et al. Distally based capsule-periosteum interpositional arthroplasty for hallux rigidus. Indications, operative technique, and short-term follow-up. J Am Podiatr Med Assoc 2003;93(5):349-366. 22. DelaCruz EL, Johnson AR, Clair BL. First metatarsophalangeal joint interpositional arthroplasty using a meniscus allograft for the treatment of advanced hallux rigidus: surgical technique and short-term results. Foot Ankle Spec 2011;4(3):157-164. 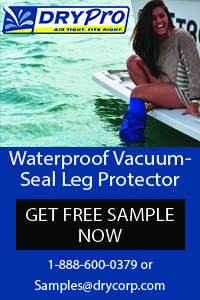 August 1, 2012 Can AFOs help prevent falls? I have been performing a modification of the Waterman first metatarsal head osteotomy for about twenty years. I clean up the first MPJ damage and then perform a dorsal wedge based osteotomy so the head of the first metatarsal is tilted back. Fixation is from the damaged subchondral bone into the shaft with a screw. The patients typically go from severe limited motion to about 75-90 degrees of dorsiflexion intraoperatably. This procedure decompresses the joint as well and I have seen patients 13 years after performing and they were doing well still. I see quite a lot of H.R. in my orthotic clinic. Many of them surgical failures (definition= 1st ray H.R.+ pain after surgery) and many other are trying to avoid surgery. I have a high rate of improving pain management with full length medial wedge orthotics with a distal drop out on the 1st ray. Supporting the 1st ray reduces the amount of dorsiflexion at heel off. By dropping out the distal aspect of the orthotic, that is from the I.P. joint to the end of the toe leaves room inside the shoe for the heel to rise, reducing the dorsiflexion “moment” by a few degrees. Coupling this modified orthotic with good forefoot rocker shoes, whether they be running shoes or dress type shoes like Dansko effectively can reduce the lever arm on the distal 1st ray by 5-8 degrees. This is often enough to make a person very comfortable. When necessary I have increased the distal rocker on a shoe just by grinding off the anterior sole of the shoe. This article was intended to be all about surgery but orthotic management plays a crucial role in H.R. outcomes. I had Fusion done to my Great Toe joint about 10 years ago because of Rheumatoid Arthritis. Dr James Brodsky in Dallas did it. He fused the second toe as well and took a little off the length of the toe. the third toe was long too but he wouldnt do anything with it. It rubs against my shoes and is painful. He told me to buy all new shoes! Had I been told of the outcome of the surgery and the ROM, I wouldn’t have done it. The joint is still as painful as it was before. I trip over the toes sometimes when i walk. They are a little too low I think. I have terrible burning pain at the tips of both toes and can’t stand any pressure on either toe. Not even my blanket at night . I can’t wear any of my shoes anymore that have even a little heel on them. The two toes rub against my shoes and Im wearing a shoe 1/2 size bigger than I normally wear. I want to have this reversed if possible. Even restore a little more ROM to the toes. My Orthopedic Surgeon that did my elbow replacement said they could give me more ROM, but not completely reverse it. He wouldn’t do the surgery but suggested I go back to Brodsky to do it. I won’t see him again. His ego is out of control! Very rude and won’t even make eye contact with you. Can a Dr here advise on what my options are for getting more ROM in those joints? the screws are coming out and I can’t stand to have any pressure over the joint at all.